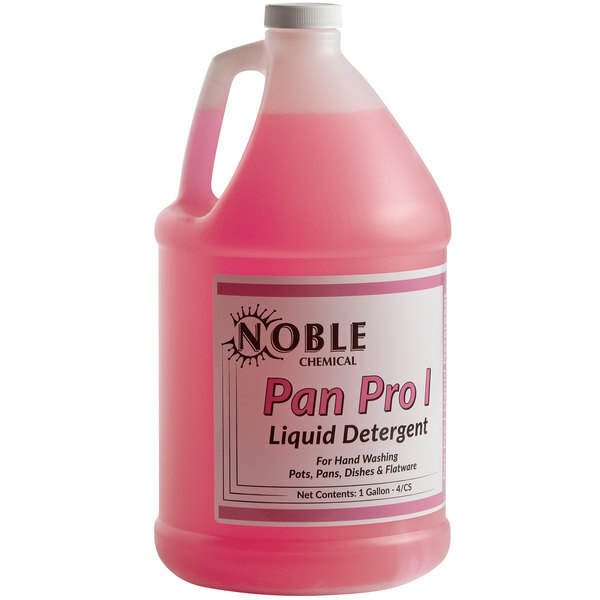 Give your pots, pans, dishes, and flatware an unparalleled sparkle by washing them with this Noble Chemical Pan Pro I liquid warewashing detergent. This liquid detergent is a high sudsing formula with a heavy-duty cleaning ability. The suds and cleaning power hold even while soaking dishes. It is the perfect solution for industrial, institutional, and restaurant settings where grease emulsification and lasting suds are a must. Although this liquid detergent is tough on grease and fats, it's also easy on your hands and dishes, making it safe for all your employees to use. With usage dilutions as little as 1 oz. per 3 gallons of water for manual dish washing, this 1 gallon container of Pan Pro I will go a long way. It's heavy-duty formula will not disappoint when tackling the toughest grease and grime in a busy kitchen, making this liquid dish detergent a must have. To use this Pan Pro I pot and pan soap, simply follow the instructions printed on the label. For heavy-duty cleaning, fill your sink with 1 oz. of detergent per 1 gallon of water. Allow the water to flow onto the soap. For optimal results, scrape and remove as much solid food and waste as possible from your pot or pan prior to putting it in the soap. Afterwards wash the item in the diluted mixture and rinse thoroughly in clear, hot water. You can also hook this soap up to a suds-control dispenser for easy handling.